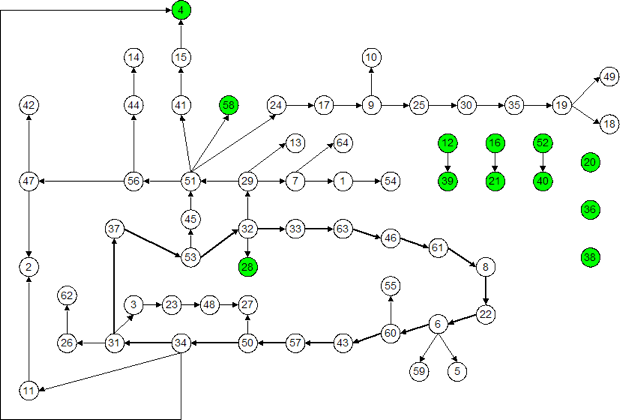 Random Boolean networks (logical networks with binary states) have been used as models of genetic regulation since the 1960s. Several results (especially in the work of Stuart Kaufmann) link the dynamical properties of this class of networks to general biological properties (e.g., number of cell types corresponds roughly to number of attractor classes). However, most results obtained until recently are for parallel, synchronous updating of the network (all nodes, or ‘genes’ updated at the exact same time). This updating scheme is unjustified physically and methodologically (it is not compatible with the Boolean assumption). Asynchronously updated RBNs (ARBNs) show very different properties. In particular, strict cycles are not possible, and most initial states will lead to a fixed point attractor. Can ARBNs still produce some behaviour relevant to genetic regulation. Using evolutionary algorithm it is possible to show the existence of ‘rhythmic’ attractors (not strictly periodic) which show extreme robustness that could explain the functioning of molecular clocks in the cell. Further studies demonstrated that this robustness is a consequence of the topology of the evolved networks which consists of inner ring structures that maintain a wave of state change which will always recover after any state perturbation. A central ring of 16 nodes underlies the rhythm produced (ring indicated by dark arrows). Di Paolo, E. A., (2001). 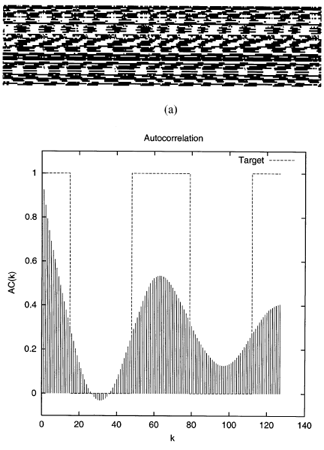 Rhythmic and non-rhythmic attractors in asynchronous random Boolean networks, BioSystems, 59(3), 185 – 195. Rohlfshagen, P. and Di Paolo, E. A., (2004). The circular topology of rhythm in asynchronous random Boolean networks, BioSystems 73, pp 141-152. Di Paolo, E. A., (2000). Searching for rhythms in asynchronous Boolean Networks. Artificial Life VII: The Seventh International Conference on the Simulation and Synthesis of Living Systems, Reed College, Portland, Oregon, USA, 1-6 August, 2000. An open problem in the origin of life on Earth is that of the origins of the genetic code. A important part of this problem concerns the question of how long templates could have evolved in the absence of enzymatic stabilization. 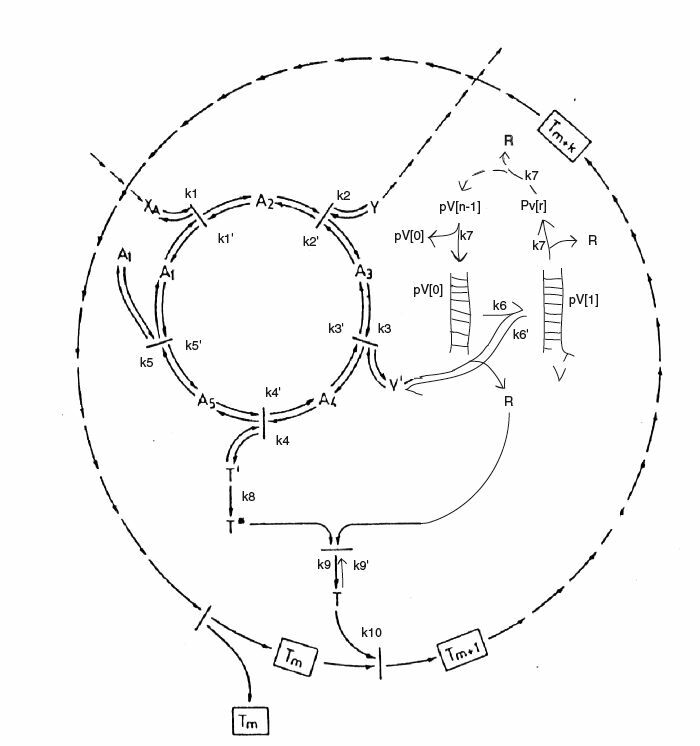 We have investigated whether a minimal cell model (the Chemoton, proposed by Tibor Gánti in the 1970s, left) could provide the sufficient conditions for template elongation by coupling the state of long RNA strands to the dynamics of the cell cycle. Even though under minimal conditions the cell dynamics produces an optimal template length, more sophisticated assumptions regarding the rates of bonding can lead to template elongation. Fernando, C. and Di Paolo, E. A. (2004). The Chemoton: A model for the origin of long RNA templates. Proceedings of the Ninth International Conference on the Simulation and Synthesis of Living Systems, ALIFE’9 Boston, September 12th-15th, 2004. MIT Press.